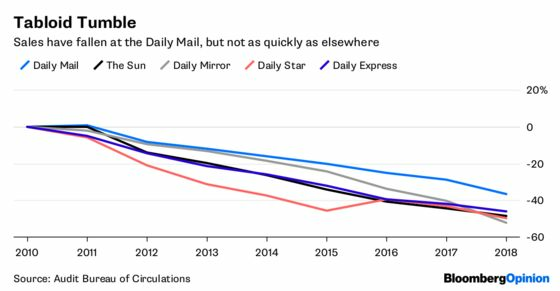 (Bloomberg Opinion) -- Paul Dacre made his reputation as an old-fashioned, foul-mouthed, newspaper editor who terrorized successive British governments by brilliantly mirroring the prejudices of his “Middle England” readership. What he’s never been during his 26 years running the Daily Mail is a website editor. While other old-world newspapers from the New York Times to the Daily Telegraph have long embraced their “integrated digital newsrooms” and the notion that the web comes first, Dacre has studiously kept the Daily Mail as distinct as possible from its celeb-loving sister site, MailOnline. It’s a strategy that has maintained the paper’s unique stranglehold on Britain’s political classes, with the vote for Brexit arguably the ultimate consummation of Dacre’s vision for the country. But with social media usurping the power of U.K. tabloids to determine elections, and the internet taking its toll on the Mail’s readership and profitability, this is a good time for the 69-year-old to hand over the reins – as he plans to do in November. A quick glance at the most recent financial results from parent company Daily Mail and General Trust Plc shows sales at Dacre’s paper and its Sunday stablemate fell 6 percent in the six months to March – caused by declines in circulation and print advertising. Adjusted operating profit for DMGT’s consumer media titles fell by 8 percent. MailOnline was one of the only bright spots, with sales there rising 5 percent, although even that was its worst performance in years. Indeed, it’s online where the Mail might really benefit from a change in direction. In fairness, the Daily Mail has done less badly than its tabloid rivals as print circulations fall. But there’s recent evidence that its decline is accelerating. As such, it would make more sense to try to tie the fortunes of the newspaper more closely to those of the website. MailOnline could certainly do with a bit of a Dacre-style livening up too. It still only generates one quarter of the newspaper’s sales, and hasn’t managed to deliver reliable profits. Readership can fluctuate according to the whims of Facebook’s and Google’s algorithms, as it did in the first half. The Mail readership’s demographics certainly support the idea of a more web-focused editor. One reason the newspaper has lasted better than its rivals is that its readers are old. That makes them more disposed to buy the print edition, and has justified the separate editorial approaches. 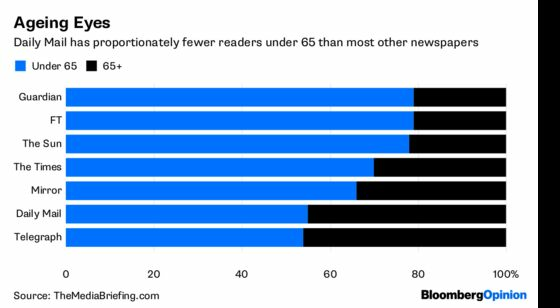 While the average newspaper reader is 59, their website counterpart is 40. The problem is that old people die eventually. A new editor needs to do more to attract younger readers, and to better represent the print edition of the newspaper online. This is tricky given that the Daily Mail’s concerns are far more parochial than those of the MailOnline, whose obsession with pop stars and Hollywood draws in a big international readership. But there’s certainly an online audience for the kind of right-wing fodder peddled by the Mail, so a smart editor should be able to square the circle somehow. Offering some premium content might be a start – the Mail does carry some very good journalism. Much will depend on the identity of Dacre’s successor. He remains as editor-in-chief, ostensibly in charge of the Mail, MailOnline and the more liberal Mail on Sunday. The promotion of one of his lieutenants might mean an attempt to steer a similarly awkward course. But just as Britain would benefit from leaving behind Dacre’s 1950s vision of a country untouched by modernity and the outside world, so would his newspaper gain from a genuinely fresh pair of eyes.